I’m on fairly thin, icy tarmac with the old cross-shopping pitch: buyers keen on the M4 who already find the Pure’s $139,000 list price an ambitious investment will likely consider the $72,610 extra the $211,610 Competition Series (aka ‘CS‘) commands a stretch too far. That’s before you fork out an extra $15K for optional carbon-ceramic brakes as fitted to our CS test car prior to factoring in on-road costs. There’s some tenuous logic that with just 35 CSs being offered in Oz annually, there might be roughly that many flush M-loving prospective owners who could stretch the extra $88K-odd for the top dog – but may consider saving as much shopping down to Pure spec if the more-affordable version was nigh on as good. Some raw numbers certainly suggest a close match on performance. The CS boasts 338kW and 600Nm from its 3.0-litre turbocharged six, while the Pure only comes up short on the output count by seven kilowatts and 50 Newton metres. Tellingly, BMW’s acceleration claims for both cars are separated by just one-tenth of second, the CS a 3.9sec 0–100km/h playing four-flat for the entry-level M4. So we pointed the heroic pair from Munich towards some of Victoria’s, and Australia’s, finest driving roads for two days to see where that extra $88K’s worth of magic the top-dog CS plies. There were laughs, cries, raised eyebrows, some conjecture amongst the crew – not a day goes by – before impressions were logged and assessment firmly made. We had a verdict. Then moments prior to fingers hitting the keyboard, BMW Australia went and slashed the price of the CS by a whopping $31,710, down to a vastly more digestible $189,900 list price. Needless to say, we suddenly viewed the cut-priced CS in a different and more positive light. BMW markets the CS as the king of the heap M4, but technically speaking it’s not. That mantle belongs to the harder-core GTS, a version that still sits aloft on pricing lists at a daunting $294,425, but is officially no longer on sale. The anchor point for the currently three-variant-strong M4 range is the Competition, more or less the mainline version that, at $156,710 list, pretty much splits the newer ‘cheapy’ Pure and extravagant-if-now-discounted CS on price, thus creating a more natural and balanced hierarchy in the three-tier Em-Four range. Prior to kick-off, I’d not driven either Pure or CS in current, midlife updated ‘LCI‘ iterations. But I’ve spent some time in the Competition, a car that delights and frustrates in equal measures. In 4 Series form, specifically, this mid-sized M-car is highly dynamic if unhinged, exciting if unnerving, an inconsistent beast seemingly highly sensitive to conditions in which it’s driven, at times lively and rewarding (dry and smooth), and downright spooky in others (wet, cold, lumpy). For very selfish reasons, I’m keen to see if either newer downmarket or upmarket M4 versions can change – indeed improve – my opinion of the breed. Does that wicked character make more sense in frills-free Pure form where you’re chasing thrills for the buck rather than sheer pace? Conversely, do the CS’s enhancements translate into friendlier, more accessible, and downright quicker point-to-point performance? Importantly, I wanted to know if there’s much difference at all between the pair, or are they in fact vastly different animals in connecting with the driver, regardless of sticker price? Before we pull their strings, a disclaimer: the semantic difference in spec between the two is important, though we’ve covered more forensic specification digs on the LCI Pure, the CS and even the GTS. Rehashing here isn’t necessary. Our Pure test car lobbed into the CarAdvice garage in quite an honest specification. Its Black Sapphire metallic paintwork ($1937), Apple CarPlay functionality ($623) and no-cost Carbon Fibre and Black Chrome trim finisher option add nothing to its driving prowess, though its 20-inch Star-spoke ‘666’ ‘Competition’ wheel package ($2500) does upsize the rubber footprint from standard issue 19-inch 255/35 and 275/35 to broader, lower-profile 265/30 and 285/30 Michelin Pilot Super Sports, an exceptionally handy all-weather high-performance tyre. These options raise the Pure’s as-tested price from $139,000 to $144,060 before on-roads. Despite having even fewer options – just two – our CS jumps from $189,900 to $205,523 list. Or $61,463 more expensive, as tested and before on-roads. Fitted is the same Apple CarPlay upgrade ($623) and the aforementioned ($15K) M carbon-ceramic anchors, replacing the four-and-two-piston so-called ‘compound’ steel brakes (as fitted to the Pure) with markedly larger matt gold-finished six-and-four-piston anchors. Its absolutely stunning San Marino Blue paint, one of the best ‘blues’ we’ve witnessed, is a standard colour choice. Tyre width matches the (optional) Pure at 265mm front and 285mm rear, but these are track-focused Michelin Pilot Sport Cup 2 spec and, unusually, 19s up front and 20s in the rear. The wheel size differential together with a suite of carbon-fibre accoutrements – the uniquely contoured and vented ’25 per cent lighter’ bonnet, front splitter, rear spoiler and rear diffuser treatment – conspire to give the CS a subtly more aggressive stance and a distinctive look. It’s easy to presume both cars have bare-boned spec lists – one on price, one on ‘theme’ – but it’s not the case. Further, and surprisingly, they’re quite equal on niceties and gear. Both get carbon-fibre roofs, Active M differentials, adaptive suspension, electric M Sport seats with bolster adjustment and cut-outs, 12.3-inch iDrive 6 infotainment with high-end Navigation System Professional, DAB+ audio, comprehensive ConnectDrive services, M-specific driver instrumentation, head-up display with M-specific content, camera-monitoring speed limit information, rain-sensing wipers, front and rear parking sensors, and ‘M tri-colour’ seatbelts. Neither is what you’d call a ‘stripper’. Differences are in the addenda, but of course we are here to split hairs. The Pure’s Adaptive M Suspension and Active M differential have specific ‘sharpened’ tunes, and the loaded-in M Competition package includes a louder Sports exhaust system than is standard M4 issue. Meanwhile, the CS gets the usually optional M Driver’s Package as standard, lifting speed to 280km/h, and has a bespoke, larger 80mm adaptive exhaust design with stainless steel tips. It also features adaptive suspension and active differential smarts, though many of the suspension links are ball-joined to minimise play and the rear subframe is rigid-mounted to the body structure. More nitty-gritty? While the Pure gets LED headlights and tail-lights, the CS is treated to adaptive front units and OLED rears lifted from the GTS. The CS gets a rear-view camera yet fits rich, waxy-feel leather trim (complete with neat M Sport blue and red highlights) with Alcantara insert and, somewhat surprisingly, seat heating. Meanwhile, the Pure gets a more fulsome surround design, but a more basic trim that’s predominantly cloth with some leather highlights on the seats. Alcantara is also used on the CS’s paddleshifter wheel, which has a thicker rim than the Pure’s leather tiller. Ostensibly, though, not much really separates the pair in the cabin – it’s more judicious use of gloss-finished carbon fibre for the trim inserts and console garnish that imparts a surprisingly upmarket, full-frills effect to the Pure. By contrast, the carbon effect is replaced by a more satiny, velvety look with so much Alcantara inside the CS, giving the pricier M4 a more track-friendly, ready for business aesthetic. Both get the rather nifty M-specific instrument cluster. Initially, the classic analogue gauges seem a bit low-rent compared with the fully configurable digital eye candy offered in regular 4 Series models, but the classy old-school design has some neat tricks. Between the gauges and the M-tweaked head-up display, the driver can monitor parameters such as oil pressure – essential for hard track abuse – as well as current damper, throttle and steering settings, which can be adjusted via handy, dedicated short-cut buttons on the centre console. There’s even a button to adjust the DCT’s clutch take-up and shift patterns. Extra weight-saving measures in the CS include a single-zone climate control against the Pure’s familiar dual-zone design, 12-speaker/600W audio with lightened hardware compared with the off-the-rack 11-speaker Pure system, and featherweight door cards necessitating the need for novel pull-straps. There aren’t even armrests, per se, or a console bin in the CS. All up, the Jenny Craig program as applied to the CS is said to save around 35kg over the Competition fitted with the same seven-speed dual-clutch transmission. Call it a still significant if hardly portly 1580kg to the ‘track special’ of the pair. But here’s the really interesting bit. Despite not having the CS’s lightweight bonnet – each boasts a carbon-fibre roof – and the various weight-saving addenda in the cabin, the Pure with DCT gearbox is only five kilograms heavier than the CS. And, of course, therefore 30kg less than the benchmark Competition. To this point, a couple of things seem clear. There’s much in nitpicking details to see where some of the CS’s premium price is justified. But as a standalone, the $140K Pure is not only very far from being slim on goodness, it appears handsomely laden with gear and something of a relative bargain for the money. At a cruise, the CS carries a slightly more purposeful aura. Some of it is the view across the more curvaceous and aggressively styled bonnet. Some of it is the more rigid connection between driver and road via the hard-mounted suspension hardware that makes the ride quality a touch more fidgety. And some of it is the chunkier-rimmed wheel and Alcantara effect for that extra ‘racecar’ ambience. Despite having more basic seat trim, the Pure effect strikes a fine balance of raciness and premium opulence that makes you wonder how and where it might lose out to a pricier Competition for goodness and niceties. Ride is a little more tempered in its Comfort drive settings, if by a pinch, though both cars get terse and fidgety over lumps and pockmarks. That said, each offers decent noise isolation bar noticeable tyre roar over coarse road surfaces, and around-town drivability is friendly enough for daily driven duties. Each has an ever-present edginess to its character, but the bottom line is the CS is ostensibly no harder to live with than the Pure. As for negatives, both have unnecessarily heavy steering around town – the CS is the heftier of the two – and BMW has yet to tune the low speed, part-throttle shunt from its dual-clutch gearbox. Their characters are quite different. Surprisingly different. And it starts with the sonics, extends through the powertrain, and by the time you get to throwing them through back country corners and sample notable dynamic qualities, there’s enough separation to favour one over the other on taste and preference irrespective of relative pricing. Both snarl on cold start-up, but the Pure’s sport exhaust – “with improved sound” – produces a bassy thrum that retains much of the unloved BMW TwinPower M six’s unpopular aeroplane-like character if with meatier timbre: it sounds good, not great. The CS, by contrast, has a brighter, more metallic tone, with a more guttural bark: great, if not quite glorious. The Pure maintains the six’s familiar low-to-mid-rpm torque surge, which brings a sense of urgency to off-the-mark and low-speed rolling tractability, but famously has the kind of immediacy that tends to want to unhinge the rear tyres. All 550Nm clock on at just 1850rpm, and despite hanging on until 5500rpm, this engine’s pull does soften off as the 5500–7300rpm peak 317kW powerband arrives. It doesn’t have nearly the linearity throughout the rev range as the numbers suggest. There’s much more linearity in the CS engine. For one thing, its superior 600Nm doesn’t arrive until a lofty 4000rpm, though most of it – a Pure-beating 580Nm – clocks on at just 2200rpm. This tricky tune provides a different character to the CS engine because, by the seat of the pants, torque swells more progressively and co-operatively, and that pesky mid-range torque spike that tends to unhinge lesser M4s’ rear rubber so readily is smoothed and tamed. The CS’s superior 338kW arrives at a higher 6250rpm mark, while redline sits way up at 7500rpm. In short, this engine moves its sweet spot upstream in the rev range, with more head room and a stronger swing in the top end, and it seems keener throughout the tacho needle’s climb. It’s punchier, keener and, coincidently, has a more conspicuous change in character between Efficiency and Sport drive mode calibrations. Better suited for the track? Certainly. More user-friendly and easier to modulate underfoot on the street? You bet. Then there are soundtracks. The pair sound notably different, the Pure with more bass and that signature like-it-or-lump-it throb, the CS raspier and more metallic. And this divided the crew as to which of the two offers more sonic appeal – mine’s for the CS – though either car can be quiet or raucous depending on the drive/exhaust mode. The CS’s seven-speed DCT, which gets a track-friendly oil cooler, has specific shift calibration, but frankly if it’s a shade more intuitive and focussed than the Pure, it’s a light shade. At least on the street. It’s an effective if far from stunning gearbox, generally polished if occasionally clunky at low speed, assertive with its Sport mode upshifts if not as quick and responsive as a proper high-performance transmission should be – and a yawning second-to-third ratio spread that makes keeping the engine on the boil in tighter corners tricky, more so with the Pure than the CS. The form guide states that essentially damper rates and joints separate the CS from lesser M4s. But difference in rubber from the Pure’s more all-weather-oriented Michelin Super Sport street rubber than the CS’s track-savvy Cup 2s, together with how each chassis is tuned to shine on specific surfaces and conditions, conspire to two quite different dynamic packages. That said, both M4s have a firm edge to their chassis that seem skewed more towards paying handling dividends on smooth racetrack hotmix than they do on narrow, inconsistent, lumpy and crowned Victorian country roads. Starting at the front end, steering, grip and point all feel different between the two cars. The CS’s Cup 2s are a little squishy cold, but on our 30-something-degree mid-summer test days they generate heat quickly, returning humongous adhesion and confidence tracking a chosen line without hint of understeer. The 19s’ larger-profile sidewalls offer a touch more compliance without robbing steering feedback, and despite being strangely inert just off dead centre, the direction finder is noticeably more linear and consistent of the two M cars. The Pure’s lower-profile 20s impart crisper response off centre but lack the outright grip – in hot, dry conditions at least – and accuracy of the CS. It’s less consistent through the steering arc, something of a current-day M3/M4 trait, and the front end is more sensitive to chassis weight transfer. Is it bad? Far from it. The Pure points and shoots with proper high-performance confidence. It just demands more measure, concentration, and at times patience and restraint from the driver – at least when negotiating the twisty, pockmarked backroads. If there’s one area where the CS ‘fixes’ the M4’s biggest foible it is balance. Unlike the Competitions and, as we’ve just discovered, the Pures in the line-up, it feels as if the same development team tuned both ends of the flagship version to complement each other. 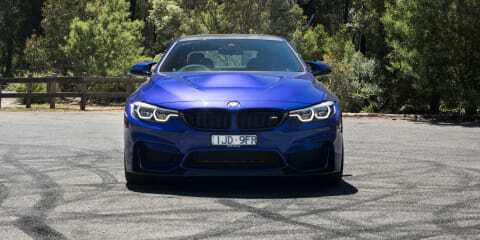 The tail of the CS doesn’t snap and unhinge itself as suddenly and violently as the other M4s, some of which is surely the Cup 2 rubber, some of which is the engine’s more linear torque delivery, some of which might be different damping in Sport mode. Little bits of polish here and there that combine to lift the game with measurable effect. Even in an environment where it perhaps wasn’t tuned to ideally shine brightest – outside a racetrack – the CS is more effortless to drive at a pace, where the Pure starts to get a little ragged, and returns quicker pace once you dig in harder. Meanwhile, the more affordable M car sticks truer to the tradition of its current generation: the engine’s torque spike wants to unhinge those rear Michelins too easy; it’s a handful in tighter corners and imbalanced during big shifts in weight from one axle to the other; and it’s an animal that will bite if disrespected, for better or worse. Of course, that’s the relative and forensic differences under scrupulous back-to-back analysis. The broad view is that, realistically, little separates these very quick and impressively capable stablemate twins. There is one very positive upshot to the Pure’s frisky, firebrand nature: it can be an absolute hoot to punt at speeds that won’t risk your licence. These are very quick and capable cars, and for some tastes one that’s lively without venturing much beyond the posted limits will be more appealing than another that’s just getting its mojo on well into ‘you’re nicked’ velocity. Here’s another rosy view of the cut-priced M4’s nature. From experience, I know the Super Sport tyres are excellent once the ambient temperature plummets and are particularly good on wet and slippery surfaces, conditions where Cup 2s’ talents fall off a cliff. Across these same Victorian roads, for much of the year, the relative capabilities of these two M4s might well be very different than they are during a sunny summer testing. For instance, even in tailor-made conditions for the CS to shine, the amount of time the ESP light spends flickering away in the instrumentation is mildly alarming. The brakes? Apart from the $15K hit to the hip pocket, the CS’s monstrous matt gold-coloured carbon ceramic anchors presented no detriment to all-round driving. They’re progressive and easy to use cold, they’re friendly at low speed, and there’s no added, unwanted noise. But if the balance of driving is more on than off street, there’s really little reason to upgrade beyond the excellent standard-issue iron disc arrangement. Does the CS feel quicker, more potent and more serious than the Pure? Back to back, by the seat of the pants, indeed it does. Is it more ‘special’ by means of feel-good, petrolhead indulgence? Yes it is. Does its added holistic goodness stack up to a 42 per cent premium in price? Well, no. Not unless a fair chunk of the extra $61K-odd investment is counted as exclusivity. And whether or not you’re a racetrack regular. What is really impressive about the M4 Pure is just how fully loaded and amply capable it is for its $139K ask. It’s exceptional value not just relative to the CS, but within the premium European, mid-sized, properly high-performance set. We expected a stripper with conspicuous cost cutting and it’s nothing of the sort. The cut-priced M car maintains all the good stuff that matters, be it forged wheels, carbon-fibre roof, or the standard-fit Competition package addenda. Some of the massaging – engine tune, chassis balance – makes the CS the fitter drive. And yet so many of its geeky headline features centred about weight saving – carbon-fibre bonnet, the single zone air-con, those funky door cards – simply don’t stack up as genuine go-faster enhancements in the range-topper. They’re cool, perhaps, but much of what the CS brings to the party seems more like window dressing than additions or deletions conspiring to a harder-core package. Slicing a huge chunk off the CS’s price has certainly made it a more desirable prospect, if not enough to swing the win away from the wallet-friendly Pure. 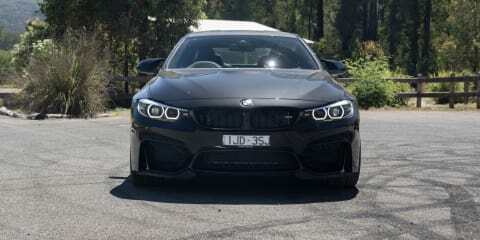 Update: BMW Australia has since confirmed that all M4 CSs delivered to customers to date have been sold at the revised, lower $189,900 (plus on-roads) pricing.